After a short break its back on the field again with four fixtures in five weekends, the fifth weekend being regional trials. We begin with our first ever visit to Kettering - a well established team in Northamptonshire which Fern may be able to fill us in on being as she has played alongside some of them with her county. They will be visiting us two weeks later. We will also play Buxton (a "very keen" team from Derbyshire, and reputedly one of the best sides in the North West of England), and possibly Oundle (also Northants). The address of the ground is Waverley Road Kettering NN15 6NT and a map etc can be found at http://www.ketteringrugbyclub.co.uk/map1.htm. Distance 54 miles, travel time c60-90 minutes depending on which site you look at, and the state of the A14 . Kick-off 2pm, so meeting 11.15 for an 11.30 departure with the aim of arriving at the ground by 12.45/1.00pm. Please let us know if you need a lift or if you are travelling direct. Thanks to those of you that turned out last night was a really good hour. The next session will be Wed 3rd Jan. 6:50 - 8:15. Reminders that I need tour program player profiles to go alongside your mug shots in the tour program. I've had some but I need one from everyone so please get them to me. It doest have to be by email can be by hand at training. Tour deposits are needed as soon as possible as we need to start confirming accomodation. £10 to be returned with the parental permission slip to me ASAP. And finally lets get the new year off to a good start and find the form that we had at the begining of the season!!!!!! Hope you all had a brilliant Christmas Day and didn't eat too much!!!! For the U17s there will be a get together this Wednesday 27th Dec to for a bit of a game and hopefully to meet your coach for next season. 5pm meet to finish approx 6pm. Please bring both trainers and boots. Would be great if we could get a good turnout but I know some of you have family commitments. Please let me know if you can't make it. Also that night Saracens are at Home to Northampton 7pm KO. With remarkably apposite timing considering recent events new instructions for referees have been issued which apply to ALL levels of the game. The full statement appears in Touchline and on the Herts blog but basically referees are being encouraged to clamp down on foul language or abusive gestures by players or match officials. The statement also underlines that this applies to "acts contrary to good sportsmanship" which, in the light of recent events, is interesting. The jury is currently out on exactly what "good sportmanship" is, though I am hoping for a statement fairly soon on this and confirmation on whether the definition is stiffer for coaches at a junior level. Note that disciplinary code also say that "Referees must also always report any unacceptable abuse or offensive language by coaches, spectators or others from the touchline" - so its NOT just players!!. Can we please have tour deposits for all those players and parents wishing to come on tour, returned by the end of the month. As many as possible to be returned on Wednesday please. We have changed our accomodation and need to confirm as early as possible, with the Holiday Inn, how many rooms we need. The tour of I E Weldon College, Ontario took a step forward today when they confirmed that they would like to stay at Wymondley Woods scout camp (just outside Willian for non-scout people) from 3rd to 5th April. It therefore seems more than likely that our U17s will be playing the Canadians on the afternoon of 4th or 5th April, so the date hs been added to the fixture list. So if you are likley to be away the week before Easter and would therefore be unavilable for a game then please say so NOW. We do not want a team to travel 5,000 miles to play us if we end up being less than full strength! We also want to entertain the girls while they are here - so maybe if a small group of you could get together to come up with some ideas? U17 training - seasonal "fun" session. 6.45-8.00pm. Club charity fundraiser. See here for details. Members of girls teams invited - but please let organisers know you are coming! U14 and U17. First full training session of New Year. On her last day in her role as Hertfordshire's Women's Rugby Development Officer Amanda Bate has called on clubs to "promote the highest standards of behaviour". 1. Check that everyone working with girls has an up-to-date CRB check. 2. Ensure girls are coached in good sportsmanship. In particular she asks coaches and players to ensure that they..
try and win through having good rugby skills, not through intimidating the opposition! 3. Remind parents of the "spectators code of conduct" - its not just players or coaches who can be disciplined! 4. Reminded coaches and parents that girls rugby is also about developing the girls as people, and enjoying the game. Coaches need to lead by example. Bad feelings between clubs and coaches will rub off on the players, and that is not a positive. Amanda concludes by saying that Herts has got really good girls rugby going on and it would be a pity to get a bad reputation for poor behaviour from parents, coaches or players. She will be writing to clubs to ask club refs to remember that girls play to the same laws as reagards discipline as boys. Don't I know you from somewhere...? Its a 24-hour job this, team management. You can't get away from it - even on a visit to Morrison's you find players lurking in the fizzy drinks aisle. So where do you go to escape and get away from it all? Why not the theatre - a pre-Christmas entertainment. This looks good - James and the Giant Peach at the Queen Mother Theatre in Hitchin. The play begins. After a while there is a crowd scene - a scrummage of villagers attempting to see the aforementioned peach. And who is that driving through the centre... Samantha Theobold Roe from the U14s. I try to look inconspicuous, which is a shade difficult is you are sitting two feet away in the front row. Samantha - who later shrugged off the inconvience of possibly being squashed to death by the peach (whether she was on not depends on your interpretation) to come back later and eat the thing before finishing off in a dance routine as the end - didn't have any lines (excited squeals aside) but looked a shoe-in for the role of Alice Liddell if they ever did a proper Alice in Wonderland. The short run at the QMT has now finished and seems to have been a virtual sell-out. News on a transfer to the West End is awaited. First - well done to the U14s who performed really well in their game with the Hertford girls - Vikki in particular was (I thought) one of the best players on the field, especially with the ball in her hands when she repeatedly crashed through the Hertford girls. In addition Anna, Hayley and Laura also performed well - Hayley looking very good with the responsibility of captain. If only we could find three or four more girls (and above all one BIG girl!) the U14s would have a very good team. As for the U17s a tale of what might have been perhaps. In fact - with almost the entire team being changed at half time - to a great extent they played two games, the "First Half Team" winning comfortably 15-7, the "Second Half Team" losing 20-0. Why the big difference? And why are we "winning comfortably" by actually narrow scores? One factor is that substitutions disrupt teams - as we saw when we played Sudbury - it takes a few minutes to adjust to even the best players coming on. However, as we have a policy of giving everyone as much game time as we can (which did not work entirely well for Nikki yesterday - best laid plans and all that - sorry, Nikki!) with a big squad its kind of inevitable. At one level that doesn't matter because the result in any game comes second to the interests of the players. A club or a team is best judged by how they treat the least of their players and I'd MUCH rather lose a game than have anyone standing on the touchline for the whole match - because in the end results are forgotten within days, but the experience of playing can be rememered forever. Beyond that though why such a turnaround? First, the "First Half Team" made it look too easy. Aside from the start of the game, they were never seriously troubled and should have scored more. This may have even lulled those that came on next into thinking it was easy - in practice Hertford are not a bad side by any means and by the time they'd realised that the first half lead had been lost. And then some. Bringing back on Haley and Nim stabalised things, but it was too late to turn it round. Secondly, I think we forget or easily overlook how good some of our forwards are. Rosie, Robyn, Charley and Nichola don't make headlines, rarely feature on the scoreboard, and do not get into county or regional teams, but they are now an experienced bunch who do an astonishing amount of work winning and retaining the ball. Which is not be belittle the pack that came on in the second half - on paper they are just as talented (indeed in theory more so) and did include Sasha - but as a unit they were not half as effective as the first half group. I haven't seen the video, but the calls from the touchline in the second half indicated that things were not going as well. Was there too much reliance on Sahsa? Was Sasha too worked up having missed the first half (a sort of "reverse Hayley" - some coaches seem to have noticed that leaving H off at the start generally makes her so angry that when she does come on plays blitzes everything out of the way). Whatever the reason, whereas in the first half Hertford rarely kept the ball for more than a phase or two in the second they were continuing the full ength of the field. And one final thing. We do seem to relax on a lead too easily. Worthing, Saracens, and now at Hertford we have dominated play, scored a couple of tries and then not killed the opposition off. With Worthing there was never a problem, but Saracens nearly sneaked a game they should have been well beaten in and now we did - over the two halves - lose a game that was already won. 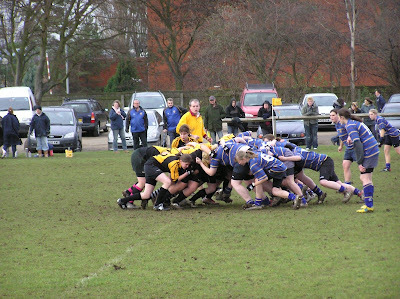 Take a look at this photo of the a scrum in the game against Worthing last week. We dominated this phase of play throughout most of the match, and as a result also won the match. And looking at this photo you can see why. Look at the Worthing girls' legs. Katie has barely put the ball in, but almost all their legs are straight - they cannot push, and can only dig in. Now look at their feet - especially the No.8. They are all pushing from their toes and have hardly any of the soles of their feet on the ground at all, which means on damp ground they are going to slide. Notice that the No.8 is barely touching the ground at all! You can't see much about our teams positions but from what you can see - while not perfect -there seems significantly more chance for our girls to push far further and stronger because their legs and bodies are not yet fully extended, and the feet are firmly planted on the ground. So there you have it - thats why the forwards are generally doing so well. Keep it up! 28th December is again "Glitter Day" at Letchworth. This is a day of charity rugby at the club, designed to raise money for the Marie Curie Nurses. The idea basically is to have fun, and play a bit of rugby dressed in something mildly outlandish (and glittery). "Mars" (Pete Marsden - behind the bar - who runs this) is particuarly inviting juniors and girls to get involved this year (in the past its been restricted to adult branches of the club), so is anyone up for burning off a bit of Chistmas excess and benefiting a good cause at the same time? Obviously its betteer is we know that a reasonable number of your are likely to be able to come down for the afternoon (it all "kicks off" at midday) so if you can please let me or Joe or Mike know asap. At the request of two of the three regional U17 coaches Jess Robinson will now also be at the regional trials on the 28th January - making seven Letchworth trialists in all. ... is hard to come by. There is a link to a page of results on the RFUW website, but when you click on it you find that its LAST YEAR's results. There is only news about this year's competition on the website features the performance of, well, us - there is nothing else at all, not even a list of the competing teams. I've therefore been trawling around the wesbites other likely entrants and the main thing I have discovered is that many, even most, clubs - even those with big, strong girls teams that anyone in their right mind would be proud of - seem strangely embarrased to admit they exist. Exeter Saracens have the link to their female pages in a smaller font than the other main links, Worcester admit the team exists but give no news as to their activities, and Plymouth seem to have a very small photo but no links to any information at all that I could find. I could find nothing on the U14s, by dint of much careful detective work I discover that the U17 south-west qualifier took place at Ivel Barbarians in Somerset and featureed six teams - Wimborne, Hucclecote, Taunton, Ivy-bridge [a combined Ivel/Bridgewater team from Somerset that has no connection with "Ivybridge" from Devon], Thornbury, and Reading. So that gives four qualifers - two from Herts, one from Dorset, and one from Somerset. As one qualifier was played in Somerset (at Ivel Barbarians) and one in Hertfordshire (at our place), my guess is that its unlikely that the semi final will be in either county. In addition Dorset is kind-off in in-between Herts and Somserset - so I suspect that the U17s will be on a trip to Thomas Hardy country on 4th February. Journey time - two and a half to three hours, or about 134 miles. Wimborne we know, sort of, as we played them in the National Sevens Plate semi-final last season - see March in the calendar. Yes - the game that took place in a monsoon! Typical southerners - quick backs, forwards of lesser reputation. They are in the same league as Worthing... but a division BELOW. Ivy-bridge are a combination of Ivel Barbarians and Bridgewater. They did beat Thornbury, who were last year's finalists, but other than that - being a combined team - its anyone's guess. Ivel on their own have won three out of five in the "Somerset and Gloucester Friendly League" (this is presumably one down from the "Somerset and Gloucester Deadly Enemies Conference"). They do have the England U19 No. 8 - 17 year old Marley Packer - in their line up, so may well have a pack better than the average for the south. Sasha will relish this game I suspect. ... though there is a rumour that at U17 they will include some familiar "guests"! Anyway c12.15/12.30 start, so I suspect arrive by 11.15. If you need a lift ASK NOW so we can sort things out ideally at training tomorrow, including the time of any meet at the club that may be needed. Journey time from Letchworth is only about 30 minutes. Directions - very simple this one. Basically make your way to the A10 and at the Rush Green roundabout (signposted for Hertford) take the B1502 towards Great Amwell. Take the first left (Hoe Lane) and the ground is approx 300m on the left. Last game before you get two weeks off to stuff yourselves and become obscenely unfit, so let's have a good turnout - especially as the U17s at least have something to "put right"! Big "do" at Saracens RFC, Bramley Road - drills, chance to meet, train, and talk to Saracens & England women players, food, photos, fun stuff. Everyone invited. Completely free. The event "kicks of" and 7.30 with the drills and training activities, which go on until around 9 o'clock, and the evening itself is due to finish around 10pm. Saracens v Narbonne at Vicarage Road, Watford. As last year a game as been dedicated to girls rugby, and girls from the county will make up the Guard of Honour. Last year we made up at least half of the girls who went - certainly we were the largest contingent from any club. This year we should do even better as the U17s at least have a game at Saracens (Bramley Road) in the morning (U14s its still up in the air a bit, but probably you'll be at Bramley Road now as well). Tickets will be "discounted" to £14 for adults and £9 for juniors - but if you order online its actually £3 cheaper than this for juniors! A commercial event photography company took dozens of pictures at Westcliff last week - some good, some rather amusing. I know Nikki is likely to be particularly impressed of her picture in the Herts B v Essex game, and Hayley is going to love her Michelin Man look as water-carrier in Herts v Yorkshire! And you can have them printed three feet high!! There are no Letchworth girls in the U14 list, but we have six in the U17s. These include three county nominations (Laura, Hayley, and Nim), one from the Barbarians (Emily), and two "wildcards" (Sophie Boorman and Katie). These six will attend trials at Ely RFC on 28th January. Well done everyone today - two superb performances in the first two games with Worthing (the South east League champions, no less!) and Saracens, and then giving Welwyn a real scare too in what was without doubt our best ever performance against them. A last minute withdrawl from Surrey side Cramberley left four teams in the contest - us, Welwyn, Saracens/Fullerians and last year's South-East League champions Worthing. Worthing's back line was as fast as we'd expected - but out forwards dominated the game so m uch that their backs were starved of useful ball amd in the end we were far more comfortable winners than the 10-7 scoreline suggests. It was much the same story with Saracens/Fullerians - 10-5 this time, and despite losing Nichola and playing with only 14 in the second half. So we were through! Just the small matter of Welwyn left though, and we did superbly almost holding them to 5-5 until a try just before the break. The second half went less well, but still our best performance yet. But where was everyone else? Some absences we knew of but others.... We NEEDED all of you. The second half of both the Saracens and Welwyn games were played with only 14 players (due to injury and illness) - if we'd had another Ampthill or Sudbury we could have lost! Letchworth is not elitist - anyone who turns up plays at this club. If you cannot make a game PLEASE let us know. At the last possible moment Cramberleigh have withdrawn from tomorrow's tournament. This means we revert to a single four team group, with the top two sides going through. First this blog may behave oddly over the next few days - bits may appear and disappear and such. Basically this is because the software has been upgraded. Blogger are rolling out some new clever XML-based stuff and now its our turn. In the long run it'll do neat things - its already enabled me to ditch the bar at the top of the screen,and you'll notice that posts now have "labels" so you can see - say - all the U14 news on a single page. In the short run though its a flaming nightmare - just when you thought you'd worked out how it all works EVERYTHING changes! Agghh!! Still, its getting a lot of use - 1,000 hits per month now, regularly 50 per day - 100 per day sometimes. And in recent days there's been a lot of interest from URLs based in the Sussex. Odd that, I wonder why? So, let's just say a big "hi there" to Worthing, and I hope you're enjoying the videos! Oh and hi there USA" as well - glad you like the calendar. Finally - Nikki has added some stuff to her site, including a questionnaire about county and regional matters. Cannot imagine where she got the idea from, but seriously your views on this really would be appreciated and will help to make a difference (assuming a difference needs to be made - you may all be happy with things as they are). U17 National Cup: The draw. The draw has just been made - and Joe wants you on the ground in the proper white shirts etc. by 11.45. As there are five teams, three will play in a round robin "pool" with games of up to 20 minutes each way (depending on start time - more on the below). The other two teams play in a single knock-out game of 35 minute each way. Current forecast - light rain, 29mph ("near gale" force) southerly (ie. cross-field, downhill) winds. Sounds ideal! First it might be useful to clear up "where is Worthing"? Answer: Miles away. In Sussex. Head towards Brighton, then turn right. Who are they? The "biggest club in Sussex" apparently - six rugby pitches, home of the Worthing 10s the seriously big (by also very expensive) festival in the spring. As far as their girls are concerned they appear to run two U17 teams - the "Stingers" and the "Wasps", the former being the 1st XV. They are the SE League champions and have had four recorded games this season, all wins over Esher (47-5), 3H (69-15), Mitchum (22-0), and Havant (24-19). Clearly that is all impressive but somewhat meaningless - except for their closest game against Havant... who we played and beat fairly comfortably at Beckenham. Individually their main threat seems to be a player called Amy Wilson-Hardy, a Year 10 sub-14 second 100m sprinter who plays generally outside centre (and occasionally full back) and has scored 17 tries in four games. However they have a very strong backline in general that moves the ball very quickly (according to Havant) - in other words pretty typical for a South East team (remember Petersfield?). And they have at least two kickers who seems to be able to kick conversions. So... no mugs this lot. Ok, so after a bit of confusion there are 5 of you who are going to OA's this sunday, so yes Laura is comming! Below are the directions that are on the club website. The club is just on the outskirts of St Albans, as you come in via Harpenden, on the left, as my memory recalls its just after a bend in the road. Remember girls this is where the england women play their home games, so its a very nice club. The coach for the day is Clive Cramphorn. Please look after each other, Anna knows the club well, so ask her if you are looking for anything. 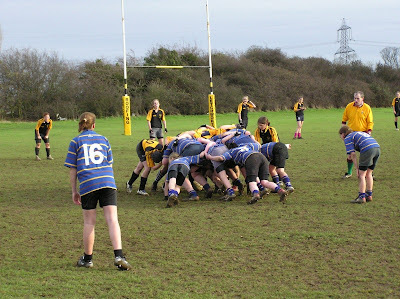 A quick note to say that Dave Roberts is now asking for the names of any parents or U17 girls who would like to take part in the "Start Rugby" course which was discussed here a week or so ago and generated some interest. If you've got Level One then you "need not apply", but anyone else with any interest in developing the knowledge of the game, helping out with coaching (especially of beginners), and generally doing more than just play or stand on the touchline, please put your name forward. The evening when the course takes place could be flexible so please also let me know what days of the week you cannot do. Mentioned this yesterday evening - and here is the school website. Now there is no guarantee that this will all go ahead, but if it does we would hopefully play them on the afternoon of possibly 4th April (that is a Thursday - but you are on holiday then so no worries/ And our tour isn't until the following week, so no worries there either). The school is about 35 years old and named after a local lawyer who gave $1 million to the local education board. Its about the size of Highfield. Its sports teams are nicknamned the "Wildcats"
The school is in Lindsay - a town of 20,000 people (so about two thirds the size of Letchworth) in Ontario an hour and a half east of Toronto (the biggest city). It actually all sounds a bit like East Anglia, and quite a few of the place names seem to be from East Anglia too. For those more geographically challenged Canada is a country in North America. On most maps its the big (often pink) bit above the USA but before you get to the North Pole. And they do speak English!!! Talking of which its National Cup on Sunday. If it is confirmed that Uttlesford have withdrawn then three teams will play off in a round robin for one semi-final place (c15 minute halves), and the remaining two will play off for the other place (c35 minute halves). The draw to decide who does what will be at 12.45, and we start at 1.30 - or sooner if possible. Meanwhile we hear that Sasha is unwell. Remember to send her appropriate messages such as "get well soon", "get well REALLY soon", "get up, you're needed", and maybe "come in no. 8..."
The U17 county coaches are attempting to set up an extra game on 17th December (see here for details). As a result Welwyn have now cancelled our game on that date - after all without Welwyn any county fixture would be impossible. However at Letchworth - as this was originally a club date - we will be attempting to organise something at club level for that weekend as otherwise most players would have only had one weekend of rugby in three weeks (or four if you include the cancellation of the National Cup ten days ago). I've had a few questions about ordering these so just to confirm. No you don't have to order them yourselves over the internet. Mike Alcock is ordering batched of 10 to keep the P+P costs down. So if you would like your copy of the calender before Christmas then your order needs to be with Mike Alcock by Sunday along with the £11.50. A reminder that all the profit on these calendars is going towards the tour so get the word out, get selling to your familes, relatives, friends and lets get some money in!!!!! I know that tomorrow night there is a talented athlete something or other at the sports village. I have no problem with those on the scheme attending this and understand you wanting to complete your fitness tests and therefore as this has been on the calendar since the start of the season you missing training will not affect your game time on Sunday. However I have also been informed that at the last minute the county squad have been invited to attend the nutrition talk. This will now be the 3rd week in a row, 2 of which that were unscheduled and with late notice. Welwyn have asked their players within the county squad NOT to attend the talk and attend club training instead, due to the cup matches this weekend, and I am now doing the same thing. If you are in the county squad please do NOT go to the nutrition tlak tomorrow and come to club training instead, especially with the way some of you were treated by county on Sunday which I think was totally unacceptable and have complained about. Training tomorrow is hugely important as we will be preparing for the cup matches this weekend, and the main session will take place from 6:50 till 8:15.
f you are listed above and are not coming to training because of the talented athlete thing please let me know. Can all other girls refrain from turning up early to join in with the kicking session. It is a specialised session for those we feel will be required to kick on Sunday and we will not be able to cope with more than 6 players in this session. The county blog has a long article on it asking for your views on the county programme. Please could you have a look and post your comments, either on the what is in the article or on your views and experience of county rugby generally. You can even post anonymously if your prefer. Its important that we get the views of players and parents, rather than just coaches and administrators. This is YOUR programme, its there to develop you as players and also give you more challenging rugby - but you do not have to accept it they way it is. If you'd like to see things organised differently (or come to that see things stay as they now are) now if the chance to be heard! While you are thinking abut such things have a look at goplayrugby.com/survey where the RFU are collecting views on what attracts people to play rugby - and what puts them off. There are prizes to be won here! And while you are there maybe you can think of a club or team worthy of ther RFU's new "Presidents XV Awards". Far be it for me to suggest which club or team that might be... but there's money to be had here too. Eleven of our U17s and one U14 appeared for their counties on Sunday and had some mixed experiences, though they were turning out for four different sides at two different locations that is maybe not too surprising. From what I have heard so far gale force winds were the highlight of the day at Newark where Samantha appeared for East Midlands U14s and Fern for the U17s. Not sure about the results yet, but the games - against Leicestershire and "NLD" (Notts, Lincs & Derby) - were only about six minutes each way, and mainly seen as a trial for the East Mids regional team. Its a pity that East Mids County pulled out of the Westcliff tournament to go to Newark as it would have been much more interesting to see everyone together. The wind was also a factor here as well as our girls turned out for Herts, Herts Barbarians, and Eastern Counties. Herts got to the final but - after controling the first half against Essex - unaccountably fell to bits in the second. Hayley played in the first half but came off at half time. Some watching felt that these two factors might have been connected, but in practice - though H had had a damn good first period - clearly there must have been other reasons. Nim played two full games, missing out only against Yorkshire as she needed to get her shoulder strapped, and Laura play right through the whole event at prop - if there is one player who has developed hugely through her county experience it is Laura. Unfortunately Katie and Rosie barely got on the field - and Natalie did not play at all - at least not for the County team. Luckily she did get two games for the Barbarians. And in many respects it was Emily's Barbarians team (which also included Jess and Nikki) that were the highlight of the day. They may not have won any games, but they pushed both Bucks and Essex very close. However the most noticable thing was that - of all the teams present - they seemed to enjoy their day most. While other sides were fixated on winning, the Barbars were there to play hard but have fun. And it showed. The ultimate Christmas gift - Letchworth Girls: The Calendar! Are you struggling to work out what gift to get for the grandma-thats-got-everything? Still looking for that special something for your Aunt/ Uncle/ Parent/ Boyfriend? Then look no further - for today sees the launch of Letchworth U17s: The Calendar! Thanks to the photographic skills and design efforts of Mike Alcock and Phil Threlfall - plus a "Print on Demand" publishing service called Lulu - a full colour calendar packed with action photos of North Herts' finest is now available, just in time for Christmas. And its a proper, quality production - as good as any commercial calendar you'd find in the shops. The only main difference being that YOU are in it! Copies can be ordered online at http://www.lulu.com/content/551194 for £10 + £2.34 p&p - or direct from Mike Alcock for £11.50 - saving you 84p per calendar, providing more money for the team, AND your calendar before Christmas because all orders placed with Mike before 11th December should be supplied before the 25th! So don't delay - order today! County tournament at Westcliff tomorrow. This wednesday's training session will be 1 of the most important this year. We will be preparing for the cup round on the 10th and the welwyn game the week after, which I know you all want to do well in, so there is a hell of a lot to get through. To fully cover all the stuff we need to get through we need a virtually full turn out. A reminder that we are combining with Sudbury in the cup and that we can only put 16 of you into this combined side. So needless to say attendance at this wednesdays training might sway the 'selectors'. I know there is a county something or other so can all girls please email me back to let me know whether you will be attending. Directions etc. to Hertfordshire's tournament now on the county blog. The county squad have been asked to be there by 9am for a 10am start - so suggest you leave no later than 7.30. As things stand its all still on! For Fern and Samantha playing for East Midlands in Newark you have a slightly more civilised start, but you have to be up there by 1pm for a 2pm start. Best of luck to both of you - and let us know how you get on!